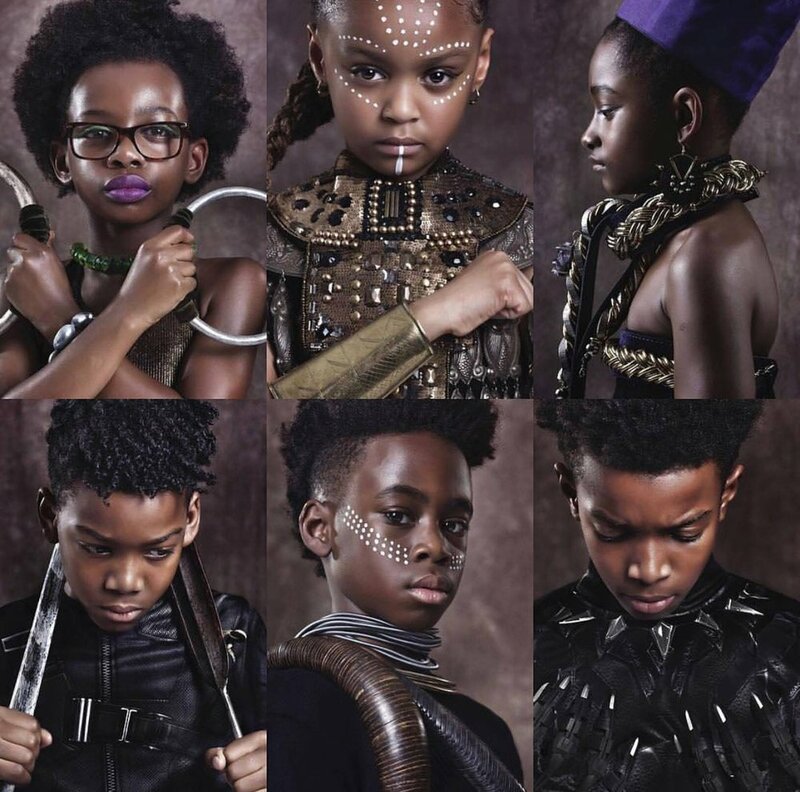 On Thursday 8th February 2018 #LooksLikeMeUK launched passion project ‘Hero in us all’ portraits of the future generation paying homage to the characters in the Black Panther film. The pop-up display will be at Black Cultural Archives until Saturday 17 February 2018 for the half-term holidays. Young people attending our 'Comic Fun: Draw Your Own Black Superhero' workshops will also have a chance to WIN tickets to the Black Panther movie and exclusive 'Hero In Us All' postcards. ‘Hero in us all' was inspired by Marvel's Black Panther film, alongside culture, heritage and ancestral royal and regal legacy of African people. The project is both inspirational and aspirational, celebrating the characters within the film and pay tribute to two of our British actors amongst the exceptional cast. ‘Looks Like Me’ raises the profile of underrepresented groups, we launched illuminating Black and Minority Ethnic children featured in advertising and fashion content, due to Selma’s daughter questioning her own identity at age three. Selma Nicholls Founder and creative pioneer of Looks Like Me talent & casting agency is also Co-founder of successful #SoWhiteProject that first launched with #ChristmasSoWhite in 2016. Looks Like Me has many talented children on their books and felt it was imperative to showcase their talent, immersing themsleves in the experience of being a hero that looks like them. Hero in us all was a meaningful experience for everyone involved - from the Production team, cast, families and beyond on a global level. The passion project would not have been possible without the vision and self-financing from Selma Nicholls and her outstanding Production team brought together by Vine Creative, acting as creative consultant for this project, assembling the creative team. We are honoured to have exhibited our passion project at the BFI -British Film Institute on 9th February and BCA - Black Cultural Archive on 15th - 17th February 2018. Going forward we aim to continue to create positive representation within content. Find out more about Looks Like Me. Models were provided by talent & casting agency Looks Like Me and the imagery was shot by renowned photographer ASIKO. The children were styled by the exceptional Fashion Stylist BASMA KHALIFA and Black Panther outfit was provided DISNEY, bespoke jewellery provided by the Pebble London and striking face art from Glorious Face arts. Asiko, London based Nigerian visual artists exploring ideas through photography. Represented by the Gallery of African Art and Rele Gallery. Basma Khalifa, a fashion stylist and brand consultant with over 10years experience at some of the worlds most renowned magazines, she continues to work on campaigns, commercials and editorials worldwide. VINE Creatives, a branding agency for the African diaspora assembled the creative team, from their roster of BAME talent. NyGlorious Face Arts, a Face and Body Painting Company based in London run by Nyomie McCook who is the Lead Artist . They specialise in Creating Bright and Vibrant designs using skin as a canvas.